twingle mommmy: Trick of Drink? Is This the new way to Halloween? Trick of Drink? Is This the new way to Halloween? Did you survive Halloween and trick or treating last night? I made it through the night by the skin of my teeth since I had a migraine from hell. Despite the pain, I was able to have a good time and enjoy our traditions. I always made eyeball casserole for dinner and then we go trick or treating in the neighborhood. Now this is our first time trick or treating in NC so there was a learning curve for us. For example, almost none of the houses were ready for trick or treaters when we left at 6. Also the kids here really have to work for their candy with all the hills! Plus we came to about 20 houses that had this on their front porch. I didn't know anyone left candy on the porch anymore. Kids clearly are more polite here in NC since every bowl we went to still had candy in it. Being the good role models we are, we only allowed the kids to take one piece of candy. Of course we also took a piece for ourselves when the offerings were good. Once we were home and the kids had surveyed their haul and ate a few pieces I went to upload a few pictures to Facebook. And that is when I realized that I was trick or treating in the wrong neighborhood! Post after post about how many houses were handing out candy to the kids and beer or wine to the parents. WTH? I wasn't offered wine or beer once! I'd like a do-over please! I'm pretty sure my migraine wouldn't have been quite so painful with a little wine along the way. 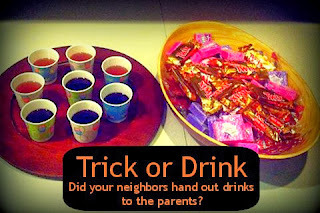 Did you ever get offered a trick or drink last night? I wonder if this is a new thing and if it will be coming to my neighborhood soon? Oh my! That sounds perfect! I'm usually a "bring my own drink obscured in a soda bottle" type as we walk around the neighborhood, but I would not mind an occasional refill here and there. Oh, and we do the candy left on the porch thing here in Kentucky, too. I've never thought to bring my own drink, clearly I am missing out. Ha, no, I was not given a drink but I'd have been happy to get one! I had never heard of that either, but read about it on another blog today! Maybe it's a new fad? I was given hot chocolate, but no alcohol. I do see parents with beers and cocktails, though. They put them in one of those kiddie wagons and have a traveling bar. Not worth the trouble for me, but my husband has been know to head out with the kids and a few beers in his pocket. Yeah, that is way too much work for me too. Hot chocolate on a cold night would be perfect too! We didn't see any drinks out but I am totally doing that for parents next year. What a fabulous idea. Living here in Atlanta, we see people who leave bowls of candy out all of the time. My kids love being able to pick a favorite. My kids loved getting to pick out their favorite candy too. I was just surprised that none of the kids dumped the whole bowl into their bag. They leave bowls out here in Texas as well, but there was nay a cocktail offered. That is AWESOME! Then I wouldn't have to carry my own cocktail around like I do every year, lol. I feel so silly for never thinking of bringing my own drink. It's the simple ideas in life I tell you. We left a basket of candy out on our porch with a sign, please take one piece and share the Halloween fun, when we were out Trick or Treating with our own kids for an hour!